Beach Lane Books, 9781442433922, 32pp. A beloved baby is the center of the universe for adoring parents.Cute toes, ears, eyes and even chubby thighs warrant hugs and kisses galore. Every action, from playing in the mud to taking baby steps to bathtime, is viewed as precious. Even the dog seems to be part of the fan club. DiTerlizzi's little one is unnamed and could be of either gender in Hughes' illustrations, though the family is Caucasian. Verses composed of four two-word lines in abcb rhyme catalog the baby's perfect features, followed by a chorus repeated after each verse. The final line provides extra emphasis, stating the enduring love this baby will always receive. "Yes, it must be baby love" changes to "You'll always be our baby love." Each line stands alone on the page, sometimes against a plain white background and sometimes incorporated within the illustrations, which are rendered in pen and ink with watercolor. 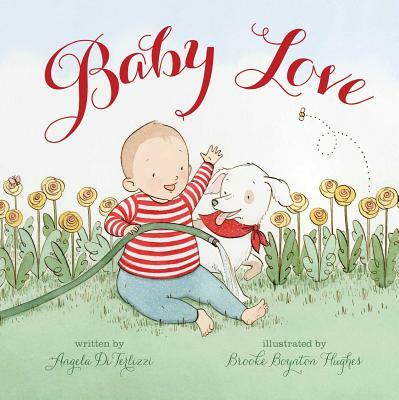 Hughes enhances the spare text with lots of detailed depictions of the baby's activities and the interactions with parents and pet, all in the softest of color palettes. It is a completely idealized version of family life, but it all works because it manages to avoid, albeit narrowly, being too sentimental. Adults will want to read this again and again with baby cuddled close. A joyful, warm and lovely bedtime story. Oh, baby: with your “Rosy cheeks./ Button nose./ Little fingers./ Tiny toes,” is it any wonder that everyone in the family (including the dog) wants in on a “Sweet kiss” and a “Warm hug”? DiTerlizzi (Some Bugs) and newcomer Hughes drop in on one family where baby besottedness is raging in the nicest way, following the adored one (whose gender is kept neutral) and its parents through a day of muddy gardening, playtime, and bedtime....whether she’s showing the family basking in the bubbles and smiles of bath time or surveying the landscape of a very lived-in living room, [Hughes'] crisp, fluid line and soft washes of color convey comfort and coziness, while DiTerlizzi’s pared-down rhymes move along with a meditative, bedtime-ready cadence. Baby makes three—or four, counting the pooch—but there’s no question in these pages who’s Numero Uno.